Not a direct inspiration but an overall feeling or emotion of sitting by the bay. 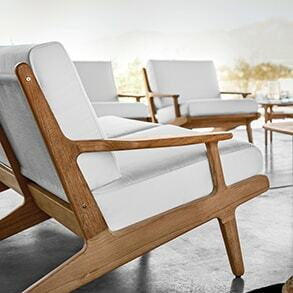 The reclined position emphasises an introverted and relaxed state of mind, therefore the name – Bay Chair. Buffed teak with White or Grey Sling as standard colours. Seagull, Granite and Caramel Slings are available at an increased price. Click here for reclining chair product specifications. Click here for footstool product specifications.